Ready to travel back to a monumental moment in British history? Then check out our suffragettes facts and learn about the time when women fought for the right to vote..
Suffragettes campaigning against the Liberal Party during the 1910 election. 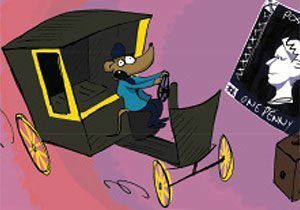 ‘Suffrage‘ means the right to vote in political elections. It is a sad fact that throughout history, there have been many restrictions placed on who can and can’t vote, based on things like age, gender, race, education, wealth and social status. 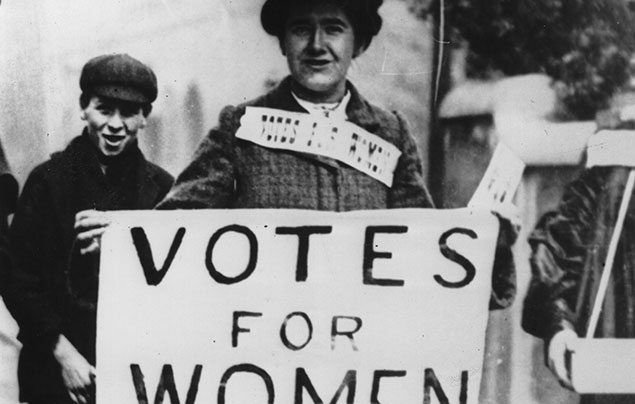 During the late 19th and early 20th centuries, men in the UK had the right to vote but women did not. Many people – including women – didn’t believe that women should be able to vote. Even Queen Victoria called the fight for women’s rights a “mad, wicked folly” – despite being a powerful woman herself! 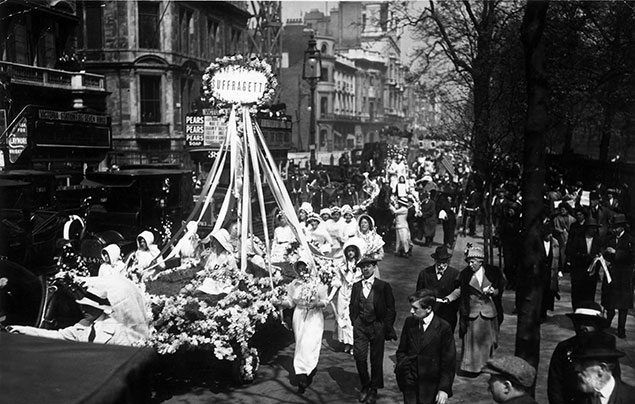 A Suffragette procession through London, 1914. In the late 19th and early 20th centuries, many women started to campaign for women’s rights. The focus of their attention? The right to vote. This became known as the suffragist movement. During this time, two main political groups formed, the National Union of Women’s Suffrage Societies and the Women’s Social and Political Union. These groups came to be known by two different nicknames, invented by some newspapers who sought to ridicule them; the Suffragists and the Suffragettes. The two groups used very different tactics to draw attention to their cause but their message was very much the same. They wore the colours purple, white and green and made banners, badges and sashes with the words ‘Votes for Women‘ displayed on them. 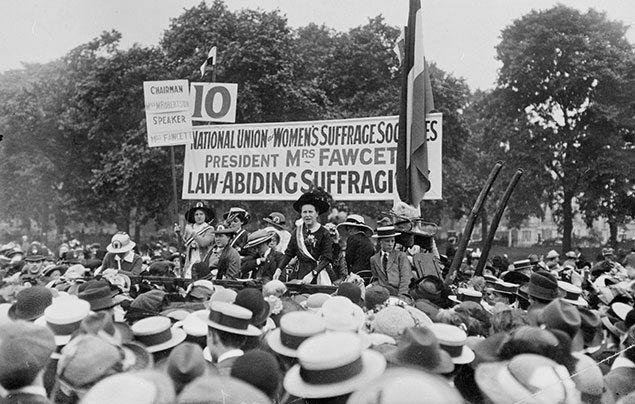 Millicent Garrett Fawcett, President of the NUWSS addresses her suffragists at a meeting in Hyde Park, 1913. The suffragists were members of the National Union of Women’s Suffrage Societies (NUWSS) and were lead by Millicent Garrett Fawcett during the height of the suffrage movement, 1890 – 1919. They campaigned for votes for middle-class, property-owning women and believed in peaceful protest. Millicent thought that if the organisation was seen to be thoughtful, intelligent and law-abiding, that they would win the respect of Parliament and in time, be granted the vote. By 1900, the Suffragists’ hard work was starting to make waves. Several Bills (a proposed law) in favour of women’s suffrage won support in Parliament, but not enough to pass… Yet! 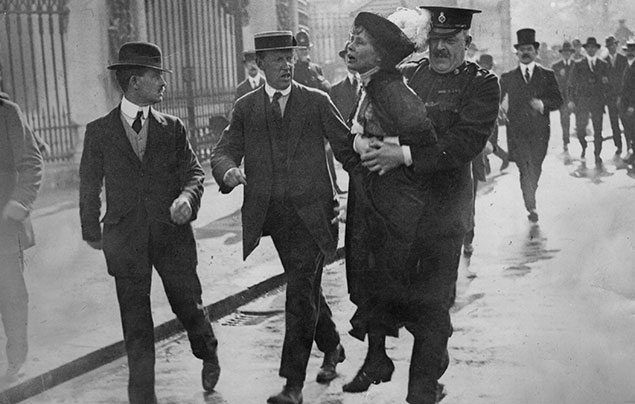 Emmeline Pankhurst – leader of the Suffragettes – being arrested outside Buckingham Palace in 1914. Emmeline Pankhurst was a former member of the NUWSS and a supporter of women’s suffrage. After becoming frustrated with the Suffragists’ approach, she broke off and formed her own society – the Women’s Social and Political Union (WSPU). The society was more inclusive and welcomed women from all different walks of life. 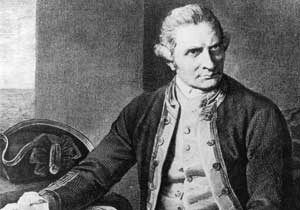 Emmeline’s daughters, Christabel and Syliva, were also active in the cause. From 1905 onwards the Suffragettes’ campaign became more violent. 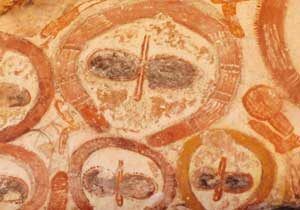 Their motto was ‘Deeds Not Words‘ and they began using more aggressive tactics to get people to listen. This included breaking windows, planting bombs, handcuffing themselves to railings and going on hunger strikes. 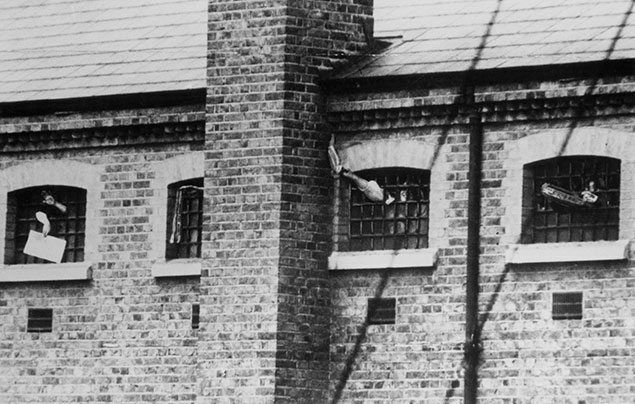 Imprisoned Suffragettes wave through the windows of Holloway Prison, London, in 1909. Many protesting Suffragettes were arrested for law-breaking and many went to prison. In further protest, Suffragettes would go on hunger strike (stop eating) in prison. To stop them from becoming ill, they would often be held down and force-fed by prison staff in a particularly unpleasant procedure! To prevent any Suffragettes on hunger strike from dying in prison, Parliament introduced the “Cat and Mouse” Act. This meant that hunger-strikers were temporarily released from prison until they recovered – before being re-arrested and locked up again! 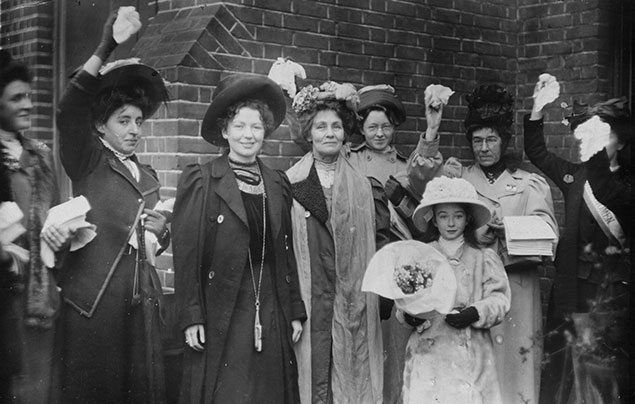 Emmeline Pankhurst (centre) and her daughter, Christabel (third from the left), are welcomed by friends and supporters after their release from prison in 1908. In 1913, Suffragette Emily Wilding Davison stepped out in front of the King’s racehorse during a race at Epsom, and died a tragic death after being trampled on. Whilst no one knows for sure what Emily was hoping to do exactly, it’s believed she was trying to pin a banner of suffragette colours to the King’s horse. Emily’s death and the cruel police treatment of the Suffragettes sparked public anger and gathered sympathy and support to the women’s cause. 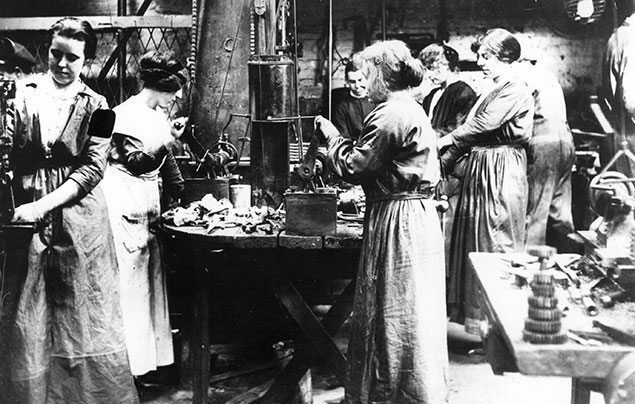 A group of women’s making weapons in a factory in 1917. 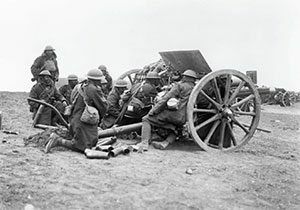 The outbreak of World War 1 changed life as people knew it – BIG time! In the midst of such huge international conflict, both Emmeline Pankhurst and Millicent Fawcett temporarily stopped campaigning and instead encouraged women to join the war effort in the spirit of national unity. World War 1 also drastically changed women’s role in society. Before the war, a woman’s place had been in the home, cooking, washing, cleaning and raising her children. But when the war began, women were needed to lend a hand! Millions of men had been sent away to fight, leaving vacant jobs that were essential to keeping the country running. Many women went to work for the first time in lots of different industries – even in dangerous munitions factories making weapons for the war! 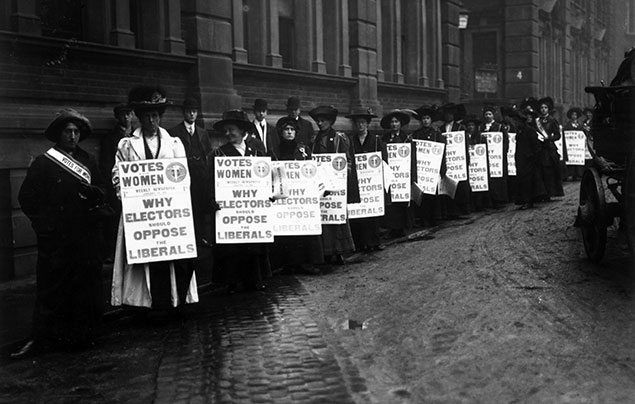 A Suffragette holds a ‘Votes for Women’ sign during a demonstration in London. In 1918, the efforts of the women’s suffrage movement finally had a breakthrough. A Bill was passed through Parliament that granted some women the right to vote. They had to be over the age of 30 and own property, or be married to someone who owned property. Despite the restrictions, it was still a big victory, giving 8.4 million women the vote! However, there was still a long way to go until all women had the same voting rights as men – who could vote from the age of 21 regardless of property. In fact, it took another ten years until women received equal suffrage with men, in 1928. How are the Suffragettes remembered? 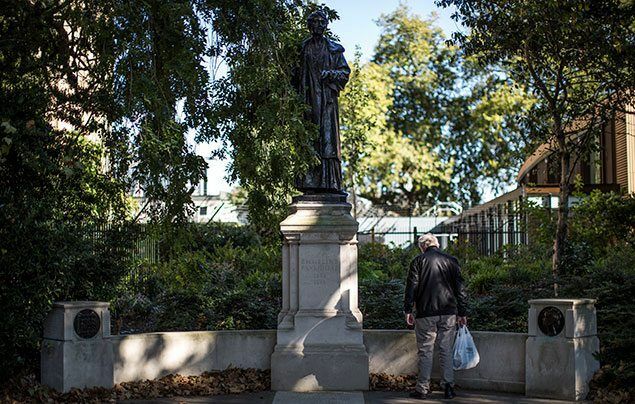 A monument to Emmeline Pankhurst stands in Victoria Tower Gardens, London, next to the Houses of Parliament. There is some divided opinion over the violent tactics the Suffragettes used to spread their message. On several occasions, they were lucky that no one was seriously injured, or even killed, by the bombs they planted. But there is no doubt that they are remembered as incredibly courageous, forward-thinking women who stood up for what they believed in – often laying their lives on the line in the process! They paved the way for future generations of women. Without them, your grandmothers, mums, aunties, friends and sisters – even you! – might have had considerably fewer rights today. That’s not to say that the fight for women’s rights is over. Around the world, including in the UK, men are still likely to be paid more than a woman for doing exactly the same job. And there are many countries today where women still lack basic rights that we take for granted. So let’s make sure the future looks even brighter for women’s rights! What did you think of our Suffragettes facts? Let us know by leaving a comment below! Hoiiiiiii these are some really good facts I have home to do about the suffragettes that I had to show the head teacher! And I was student of the month! I love it . that was really good because im learning about suffragettes at school. Thanks National Geographic!